Method(s): centerfire rifle, bow, muzzleloader as specified above. I have several ranches with large quantities of deer on them. We will be looking for mature bucks in the 17-20 inch+ class. There is also some excellent public lands that are worth hunting. The terrain on the private ranches is very easy rolling country with scattered brush, fir, and oak trees. The forest ground is somewhat steep and brushy with some open (big) old growth timber. There are also some steep canyons as well as clearcuts and grassy meadows. As with elk, I like to spend a large amount of time glassing for deer. I spend most of the year scouting, with countless hours spent behind my optics. When we reach our destination we will start at higher ground, spot the buck we want, then begin the stalk. When a stalk is made I will go with the hunter and help them get as close as possible. Physical condition is not usually an issue as I drive as close as possible before starting the stalk. The only time we will be doing considerable walking is when we need to hunt a closed spur road. I do not believe in spending time walking somewhere if I do not know for sure that what I want is there. When we get in shooting range, 400 yards or less, I make sure the hunter has a very steady rest before a shot is fired. After the buck is down my work begins again! 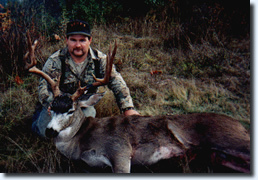 The Muzzleloader Hunt is a trophy blacktail hunt during the peak of the rut. There is usually snow which helps concentrate the animals on the winter range. There are several nice bucks to choose from. I recommend holding out for a 4x4 in the 18-20 inch class with good forks and lots of mass. This is big country with old growth timber, brushy clearcuts, and snow. I spend most of my time driving to different vantage points and glassing. Time is spent hunting trails and ridges as well, looking for a big buck or a track to follow. This is a hunt for serious trophy hunters. A monster buck can be taken during this time. The entire hunt is in high country but the ground is usually easy to traverse.